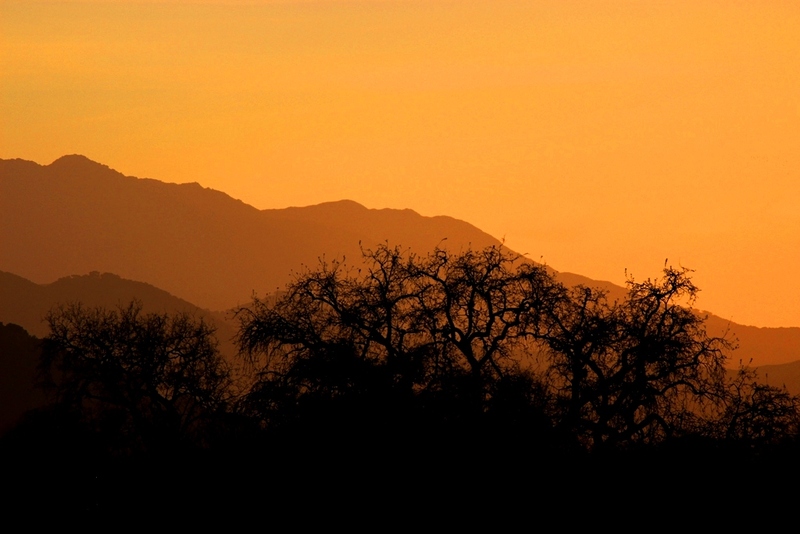 Sunset in fall, Los Padres National Forest. Rich sensory perception is the essence of human existence and it occurs in nature more strikingly than perhaps anywhere else. In the remote, less visited tracts of unsettled land exists a feeling of aliveness hard to find in any city. Where there are no distractions from the trappings of civilization or humanity’s artificial landscapes and environments, and where such buffers do not insulate a person from the natural world. Consider the point in the context of a single basic meal. 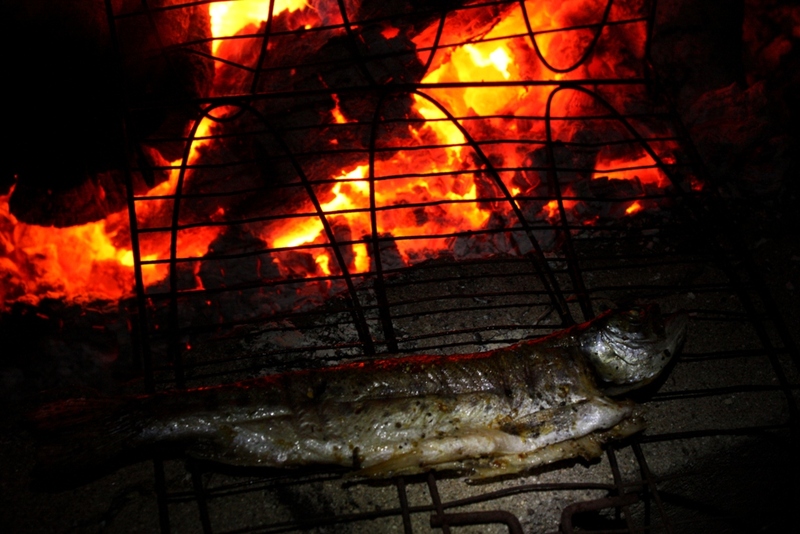 Squatting beside a wood-fired open flame circled in stones grilling a small meal out in the wilderness makes for a vividly rich sensory experience. The sizzle and snap of burning wood, random leap of unpredictable flames and flickering firelight. The dancing shadows and swirling plumes of spicy wood smoke biting at the nostrils or stinging watery eyes. There is an herbal fragrance from the cooling forest at dusk and a sweet, minerally and moist scent of a nearby stream and its soothing sound of trickling water. The sun’s radiance transferred across 93 million miles to the plant that absorbed its solar energy, used it to fuel the creation of wood, which I gathered by hand and now burns brightly, hot against my face, radiating the sun’s energy back at me through the cool night air. And the star-sprent blackened void of infinite space overhead. Transfer the cooking of a meal into the confines of a home’s enclosed kitchen, where bulbs cast never changing artificial light, always from the same angle, and make it day at any hour. I cook by stovetop over a uniform little ring of piped-in, gas-fueled, smokeless blue flame. Wood flooring, stainless appliances, granite and travertine. It’s slick, convenient and as evolutionarily efficient in storing, preparing and consuming food as any one of nature’s iconic animals is at survival. But an entire world of sensually rich experience is lost. After enjoying a meal beside the campfire I walk down to the creek for water to clean up with and perhaps to replenish supply for a cup of coffee or to drink during the night. A loud cacophony of cricket chirps and frog croaks fires forth from the surrounding darkness. The moist heaviness of the fragrant mountain air intensifies as I approach the flowing stream, the earthy scent of saturated organic matter, mud, and wood and rotting plants. The water is chilly to the touch and makes my fingers ache. Despite knowing I have nothing to fear, the pioneers and settlers long ago having killed off the wolves and grizzly bears, and not being in the place or time to worry about deadly Comanche raiders or such, I still look apprehensively over my shoulders now and again, alone peering into the blackness of the forest as if some unknown creature or entity is lurking just out of sight. The dark and remote woods, desolate, wild, miles from civilization and well out of cell phone range, makes me feel small and vulnerable as I crouch beside the creek, defensive in some manner. And it sharpens my senses. I place a bare hand on a gritty and cold cobblestone and lean down to sip the running clear mountain elixir infused with nutrients absorbed from the surrounding land and its flora. It tastes good, sweet and syrupy-like and alive with complexity altogether missing from the sterilized, processed water of the urban realm. 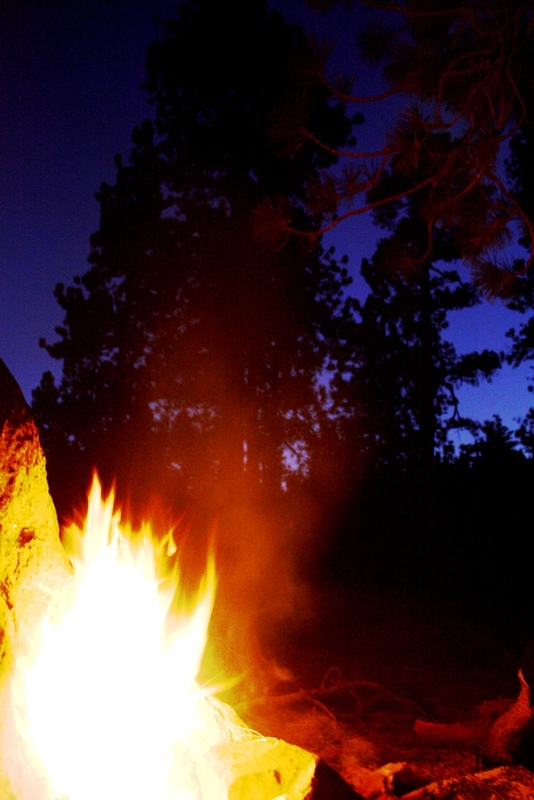 I walk back to camp watching the orangy warm glow of firelight flicker in the forest canopy. The mountain air is getting colder and the silvery glint of dew sparkles on the plants and beads up on and weighs down the spider webs. Translate the same activity into modern domestic terms and, again, an entire world of sensually rich experience is lost, life’s activities becoming clinical and lackluster. In the kitchen at home, beneath artificial lighting, I load dirty dishes into the dishwasher and press a button. The tap water smells faintly of chlorine. I place a glass to the fridge for a drink and a stream of cold water shoots out, and while filtered so it doesn’t taste bad, it still tastes bland. There is less feeling. A dearth of stimuli relative life in the open wilderness. Like lunch in the sterile atmosphere of a hospital cafeteria beneath fluorescent lights compared to an open air picnic on a warm sunny day beneath a vast blue sky. And that is but one small facet of daily life. Imagine the span of an entire lifetime and what might be given up the farther from nature life is lived. This entry was posted in Tales and tagged Backpacking, Camping, Hiking, Landscapes, Los Padres National Forest, Nature, Outdoors, Photos, Pics, Wildlife, Writing. Bookmark the permalink. You’ve convinced me – I’m gonna move over there! 😉 Our forests are dank, cold and dripping day and night. Out of the forest, it’s even colder. But sleeping out is great. I used to love sleeping out under the stars in the desert in Jordan (you couldn’t really do it here). On my own at night, in a bothy or wherever, I used to ponder over which scared me the most – a potential visit by: something paranornal? aliens? or another hostile human? In the end, i decided other humans were by far the greatest threat! Thank you for the read and inspiration. Am looking forward to the first measurable rainfall to get back into the San Rafael. Hey Bard. Thanks for stopping by. Let it rain. . . Thanks for the write up. You phrased the feeling of awearness that you gain in the forest perfectly. Keep up the awesome posts. Thank you for the time and effort. Just great a article as always. Just what I needed. Transported me right out of my office and deep into the back country, if only for a couple of minutes.